Larson E, Vail D, Mbaruku G, Mbatia R, Kruk ME. 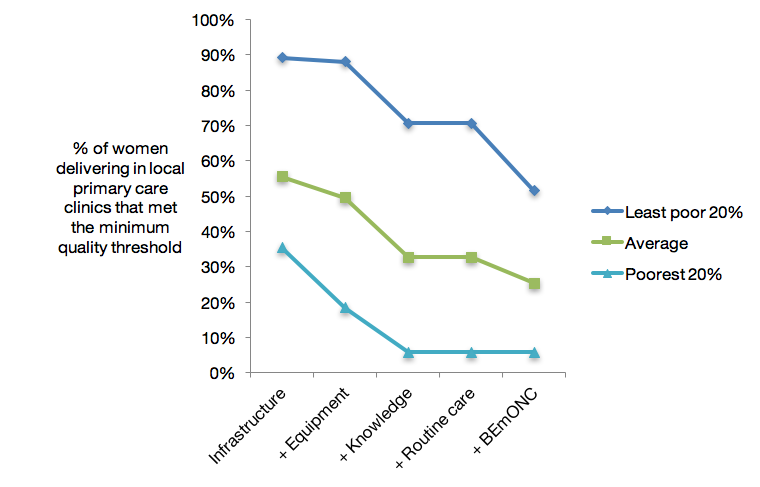 Beyond utilization: measuring effective coverage of obstetric care along the quality cascade. Intl J for Quality in Health Care 2016. doi: 10.1093/intqhc/mzw141. Coverage of maternal health services is on the rise in many LMIC. However measures of utilization alone do not reflect population benefit when high quality care is not ubiquitous. Effective coverage metrics consider population need, utilization, and quality indicators. We took advantage of a unique dataset that combines facility audits, healthcare provider surveys, and a census of the previous years’ births in Pwani, a high-utilization region in rural Tanzania. 82% of women reported delivering in a health facility and 1,096 (38%) delivered in a facility for which we have quality data. 52% of women in the wealthiest quintile and 6% of women in the poorest quintile delivered in facilities that met the minimum threshold of quality for all dimensions of quality. This disparity held for each dimension of quality assessed. Overall, availability of clean water, health worker knowledge, and provision of emergency services were the lowest scoring elements of quality. While assessing utilization makes this area look successful in its provision of maternal care, a deeper look demonstrates that women, especially those who are most impoverished, are not receiving the high quality care needed to improve their chances of safe motherhood.